If you're looking to make a design statement with your extension while adding space and value to your existing home, expert Michael Holmes recommends designing an extension that focuses on scale and form, contrast and harmony, high quality materials and an element of surprise. While a statement extension can be a striking addition to a house, It's important to ensure that your design remains sympathetic to the existing building as well as being appropriate to its setting. Our selection of statement extension design ideas is here to inspire. Find out the practicalities with our ultimate guide to extending a house. Architects Pride Road were asked to turn a 1920s bungalow in Chorlton, Manchester, into a wheelchair-friendly family home with contemporary design and sustainable credentials. A rear two-storey extension with a feature gable and grey engineered brickwork, contrasted with white render, creates an open-plan kitchen, dining and living room on the ground floor, which opens out to the garden through bi-fold doors and French windows, with level access to the slate garden paving. On the first floor, a covered balcony leading from the main bedroom creates a stunning focal point. The cost: The entire project, including internal refurbishment and a front as well as rear extension, cost £264,000. Find out all you need to know about planning a two-storey extension and designing an open-plan kitchen in our guides. The owners of this East London family home wanted a minimal but not minimalist look, with plenty of personality. IQ Glass and architects HUT created an extension maximising the glazed areas to flood the space with natural light, teamed with aluminium wall pressings for a streamlined appearance. A dramatic double-height box on one side lets more light into the staircase, and an aluminium casement below creates easy access to the outdoor space. If you like the idea of maximising light in your extension, have a read of our top tips for building a light filled extension. Find more glass extension design ideas in our gallery, too. The cost: The project cost £36,000 for the design and installation. The new owners of a run-down farm inherited buildings that had deteriorated in their exposed Dartmoor location. Architects Van Ellen + Sheryn proposed retaining half of the stone-built former milk parlour, with a glazed extension replacing the remainder. The new, double-height, green oak-framed section has a covered external terrace and a scissor truss with stainless-steel tie rods. Zinc is used for a modern take on a traditional agricultural tin roof – statement extension design ideas taken to the max. The cost: The project cost £250,000 for construction and materials. Find out more about building a timber-frame extension in our practical guide, too. Architecture for London was tasked by the owners of this south London Victorian house to turn a small, dark kitchen into a sociable space for a growing family. The new room makes use of the side return, with a polished concrete floor that extends into the garden. As the property is in a conservation area, the architects successfully argued that the stained cedar chevrons, creating a sculptural cladding design, distinguish the new from the old. The cost: The project cost £120,000 for construction and materials. Find out about side return extensions in our practical guide. Clear Architects founder Melanie Clear created a new ground-floor garden room and two gabled single storey extensions for the owners of this north-east London property. Sliding doors open out downstairs to form a suspended corner and two frameless roof windows create stunning views. Upstairs, there’s an internal balcony, with sliding doors from the bedrooms to a Juliet balcony overlooking the sedum roof and roof windows of the ground-floor extension. The cost: The project cost £360,000 for construction and materials. Read our guide to building and planning a single storey extension to get the low down on practicalities. The owners of this north London terraced house approached Lipton Plant Architects to extend their home, but retain the Juliette balcony overlooking the garden from the ground floor. Keeping the balcony meant restricting the roofline of an extension to the lower ground floor, so rather than the former wrought-iron opening, a glass terrace now forms the clear roof of the extension below, with views over the garden and into the kitchen and living space. Inside, glass and polished concrete create a contemporary look, and low energy colour-changing strip lights lead the eye into and along the space. The cost: A similar project would cost in the region of £3,000 per square metre. Read our guide to planning and designing the perfect kitchen extension to get yours just right. The family of four who live in this west London townhouse asked Coupdeville Architects to renovate and extend their home over two floors, also integrating a separate lower-ground-floor flat. The extension consists of clever statement extension ideas to create a series of spaces on different levels, visually linked together with the materials of the existing building, as well as glazing, to respond to the different functions contained within the extension. The cost: The extension together with refurbishments cost £180,000. Read our guide to converting a basement to find out what's involved. This Middlesex house lacked a dining space, so the owners asked Architect Your Home to create an area that opened up the impressive outdoor views. Designed to fall within permitted development rights, a reverse mono-pitch roof finished in semi-weathered zinc was combined with sliding glazed doors, with an aligned grid of large-format floor tiles inside and out. Flush-glazed roof windows boost daylight throughout. The cost: The project cost £110,000 including construction, fixtures and fittings. Love the idea of creating an orangery-style extension? Read our guide to find out how. A love of everything glass prompted the owners of this Winchester property to ask Andy Ramus, Mike Ford and Stephen Osbourne of AR Design Studio to design a contemporary extension with a sculptural glass staircase. Situated at the back of the house, the extension is constructed using frameless glass for a clean, delicate appearance to this open, light-filled communal area, while contrasting well with the property‘s traditional exterior. The cost: The extension cost £120,000 for materials and construction. Have a look at our guide to planning a glass extension for more inspiration. After an earlier design failed to gain planning permission, the owners of this 1920s semi-detached house in south-west London called in Paul Wiggins Architects to create a light, contemporary glass bowsprit-shaped extension. Granted consent because the structure diminishes in height and width as it extends into the garden, a cantilevered steel frame allows the doors to open out without any column support. The cost: The extension cost around £192,000 for materials, construction and fit-out. The owner of this brick-built cottage in Denbigh, North Wales, wanted a sizeable, quiet area away from the rest of the house, and asked Arboreta to create a light-filled extension. With glazing running the length of the building, the new space has panoramic garden views, with French doors fitted on both sides and an aesthetically pleasing faceted end. With planning permission for a basement underneath the extension, Arboreta worked on the two spaces together to complement each other. The cost: The oak frame, glazing and joinery cost around £70,000. See more extension ideas suited to period homes in our design gallery. Contemporary style statement extension ideas with a seamless interface between indoors and out was the brief for PAD Architects from the owner of this Kew home. An extension with a glazed sliding door system and roof lights now spans the entire rear elevation, creating a transition between the Victorian house and garden. A pre-application meeting ensured a smooth planning process. The cost: A similar extension would cost from around £150,000 for construction and materials. 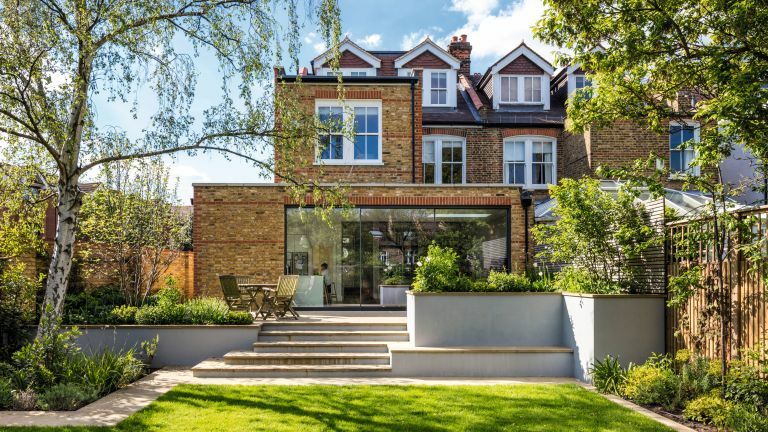 An existing extension made way for a design by Granit Chartered Architects that stretches across the rear elevation of this south London house, with the Australian owners requesting a good physical and visual connection with the garden. A sharp-edged roof overhang, which looks like a solid roof floating over the glazed clerestory windows, makes a strong yet complementary design statement, and large sliding doors maximise daylight. The cost: The project cost £210,000 for materials and construction. IQ Glass and Casey Fierro Architects were asked to create a generous extension and open-plan layout for a north London family. It had to distinguish itself from a typical glass box extension while still maximising light. The dramatic roof relates to the existing brick-built structure without exceeding its height, and shaped frameless overlights above slim-framed aluminium sliding doors fit into the shaped roof. The cost: The glazing design, manufacture and installation cost around £96,000. Located in Belfast, this Victorian house had a garage and outbuildings at the back rather than a direct connection to its south-facing garden. The owner asked Des Ewing Residential Architects to remedy this, as well as to open up the rear to capture the sun. A single-storey extension was created at garden level, with a dramatic asymmetric butterfly roof in zinc positioned to face the sun, and extensive glazing. A smaller section of the extension was finished in white render. A patio living area has also been constructed, sheltered by a new garden wall with a continuous stone seat, creating a sun trap. The cost: The project cost £210,000 for construction and materials. Find out all you need to know about converting a garage in our essential guide. It can be difficult to get the balance right when it comes to a using statement extension design ideas. You want it to be unique but not eccentric, distinctive but not jarring. If in doubt, timber is always a good option – it’s subtle, contemporary and ties in perfectly with both house and garden. We love this intricate design from Variant Office, which uses panels of Siberian larch to create a striking stripe effect. The corner window seat is perfect for enjoying views of the garden, too. Build cost: £90,000. Take a look at our guide to exterior cladding and render for more specialist advice. Curved glazing is ideal for creating a statement extension; here, it's married with slate grey bricks and elegant circular rooflights to create a modern addition that doesn't challenge the period features and original materials of the Victorian house. The wild meadow roof enhances the garden views from the first floor, and from the garden, too. The cost: this project, completed by Ar’chic Architects cost £140,000. A refreshing take on a simple rear extension, the eye-catching angles and light-reflecting, stained weatherboarding of this build make it a standout, contemporary addition to a period property. The addition of understated, stylish timber bi-fold doors and rooflights ensure the space is flooded with natural light. The cost: this project, completed by Kalm Architecture, cost £70,000 in total. Kitchen extensions: how much do they cost?